Sally Badham ‘Beautiful Remains of Antiquity': The Medieval Monuments in the Former Trinitarian Priory Church at Ingham Norfolk. Part 2: the High Tombs. The former Trinitarian priory church at Ingham once housed a magnificent collection of medieval monuments. The surviving but damaged fourteenth-century sculptured monuments to Oliver, Lord Ingham, and to Sir Roger and Lady Margaret de Boys throw much light on the complexity of painting technology used for medieval tomb sculpture and the sophistication of the effects thus obtained. The former is noted for its puzzling imagery, while the latter has unique Trinitarian iconography relating to an elite parochial guild, of which Sir Roger was a co-founder. 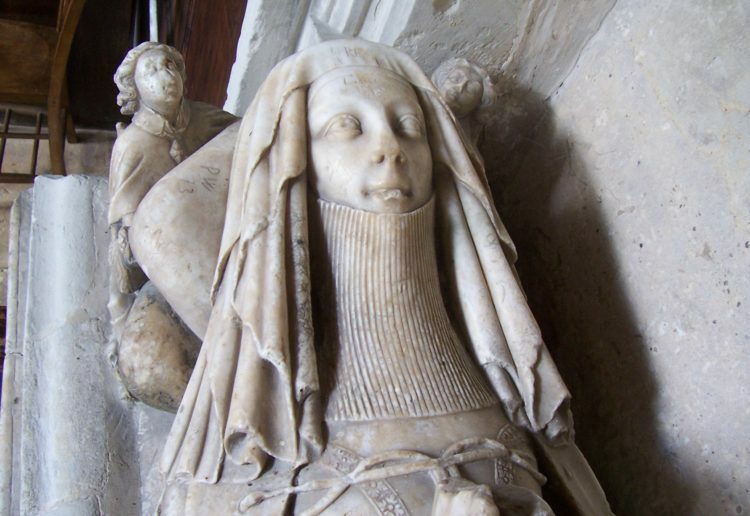 This paper discusses the impressive monument to a medieval abbess in the small village of Cañas in the Rioja valley in Spain and identifies it as that of Doña Maria Urraca López de Haro, who died in1262. A Castilian noblewoman who from early childhood grew up in the local Cistercian nunnery at Cañas, she is likely to have met St Francis of Assisi in person and also may have been, according to a local legend, a childhood friend of St Dominic, founder of the Dominican order. Her life and family history will help explain the highly individualised iconography of her monument and how it came to be commissioned. 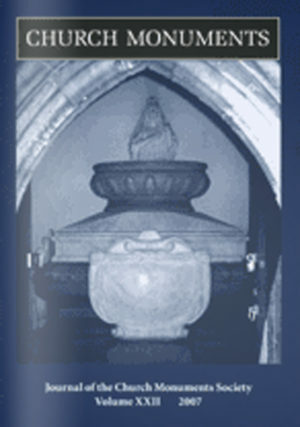 The Bruce or Ailesbury mausoleum at Maulden (Bedfordshire) was intended to present the monument to Diana, Countess of Elgin and Oxford, surrounded by a circle of effigies of her husband's descendents. Although the original intention was never fully realised, and the building altered during the nineteenth century, recent restoration makes it possible to consider the monument in the context of contemporary works and to question whether it should be properly designated a mausoleum, or simply as an interesting example of Baroque art executed during the Cromwellian era. This article offers a commentary on the correspondence and two related sketches that document the commissioning of and design for a monument to William Murray, 1st Earl of Mansfield. In the eighteenth century, such negotiations are frequently conducted on paper, in an epistolary dialogue between artist and patron. In this instance, the dialogue is between the British sculptor John Flaxman and Mansfield's nephew and heir, David Murray, 6th Viscount Stormont and 2nd Earl of Mansfield. The letters involve a third correspondent in the negotiations, Sir William Hamilton, who initiated the contact between patron and sculptor. He is shown to have superintended the entire commission, from recommending Flaxman to his relative Mansfield to selecting the preferred design. The correspondence was not only tripartite, but also what one of Flaxman's letters refers to as 'distant', with Mansfield's address being given as Portland Place, London; Flaxman 'bound by the almost everlasting operations of sculpture' in Rome; and Hamilton 'being on so respectable a footing' as the British Envoy at the court of Naples. This article will look at the way in which Victorian Arctic explorers were commemorated and how their memorials promoted rival claims to the discovery of the North-West Passage. These monuments are characterised by a developing polar iconography largely based on the sketches made by expedition members, and they reflect the influence of contemporary social, religious and scientific attitudes. George Thomson Small Gravemarkers at Temple Balsall, Warwickshire: A Remarkable Coincidence? A detailed study was made of the morphology of a set of small gravemarkers known as Dames' Stones at Temple Balsall (Warwickshire), with a particular reference to discoid and ringed cross forms. These headstones were made from 1850 over a period of more than a hundred years to a similar range of designs. The period of use and the frequency of the various forms are detailed and analysed. The discoid headstones have a remarkable similarity to some Templar markers in the Languedoc and elsewhere in southern Europe. This paper presents evidence for the probably source of design and discusses the coincidence if similar artefacts in Templar sites, which are separated considerable both geographically and in time. Jerome Bertram (ed) The Catesby Family and their Brasses at Ashby St Ledgers. J Guillaume (ed) Demeures d'Éternité: Églises et Chapelles Funéraires aux XVe et XVIe siècles.